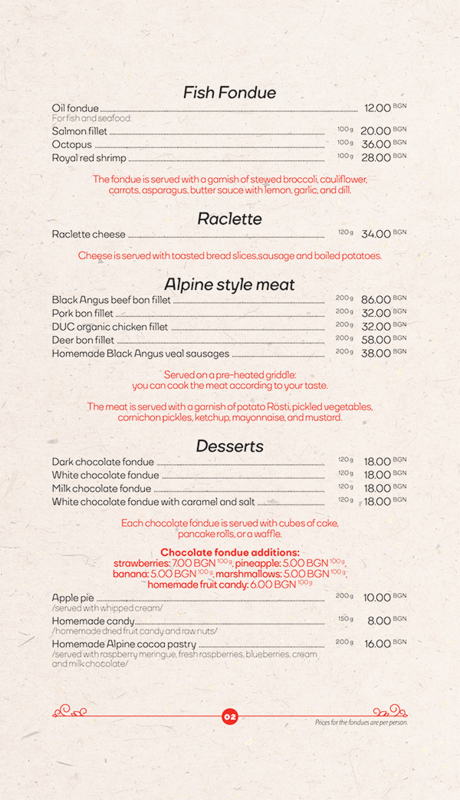 If you are tired of the taverns in Bansko, you can taste real Alpine cuisine in the Fondue restaurant. The elegant and luxurious restaurant is one of a kind and unique in terms of cuisine and offering in Bansko. 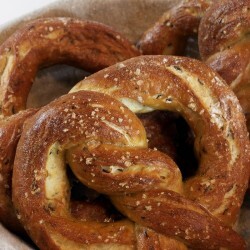 It is located in Aparthotel Lucky Bansko and offers specialties from Switzerland and France. 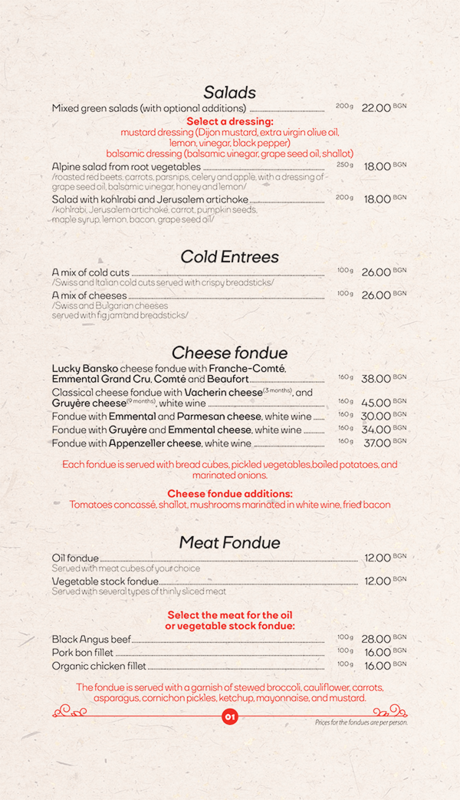 Only here you can taste cheese fondue which is consumed by dipping bread cubes in hot liquefied cheese. 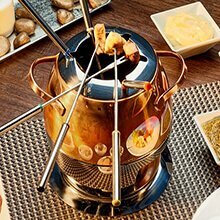 In addition we also offer meat fondue: hot oil in which different types of titbits (cut into cubes beforehand) are fried. The taste of Raclette (semi-processed Swiss cheese, spread on bread or boiled potato) is really a delight and pleasure for the senses even of the most exquisite gastronomers. The cheese fondue is made with original Alpine cheese: Vacherine (3-month old) and Gruyère (9-month old); and Raclette is made with the Swiss cheese Raclette. At Fondue restaurant you can also prepare an aromatic dish with meat choosing by yourself among several types of meat, fish or sea food. 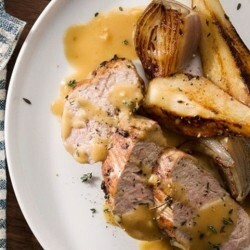 At your disposal is a hot stone plate on which you yourself can prepare the dish. 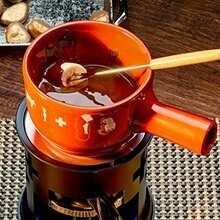 You have to try the chocolate fondue form an original Swiss recipe. We offer milk, white and dark chocolate. Fondue restaurant is decorated in Alpine style with lots of wood and above each table there is a hood which extracts all smells. The restaurant is open from 15 November until the end of March. 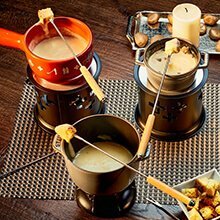 Cheese fondue is a Swiss dish served in a communal pot over a portable stove (réchaud) heated with a spirit lamp. Hot oil is put in the communal pot and the temperature is maintained with a special gas burner. 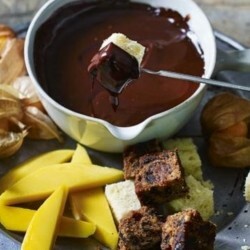 The most impressive fondue is the chocolate fondue traditionally made with white, milk or dark chocolate. Fondue is a unique restaurant that offers a different experience. It is the only fondue restaurant in Bansko; with a delicious and different cuisine, perfect service and an exciting sense of warmth and coziness. The Alpine style, the walls with solid wood paneling of thermo pine and the wooden floor of thermo ash make it elegant and attractive and give it its own spirit and radiance. Like any respected winter restaurant, Fondue has a fire place revetted with decorative white bricks and a sculpture of a stag’s head. 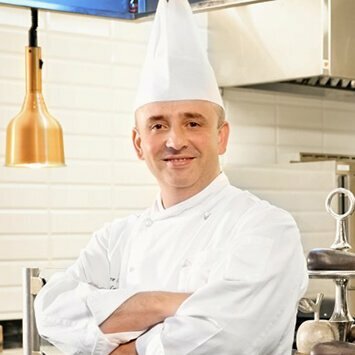 The restaurant offers show cooking as well as a separate wine bar. The tables, chairs and the booths have authentic details. They are divided by zones with the help of decorative screens with stylized Swiss patterns as well as with partition screens between the booths with a carved stag pattern on the wood. The bracket lamps complement the atmosphere with decorative stag horns. The ceiling of the restaurant is made of wood with beautiful decorative elements. The lighting is dimmed and concealed which soothes and adds extra coziness. Fondue restaurant has a capacity of 44 seats on an area of 160 sq.m. It has 6 central tables, one booth for 4-6 people with a comfortable sofa and three big booths with corner sofas each of which for 8 people, a show cooking area and a drinks bar. Above each table there is a telescopic hood that goes down to the cooking level while the dishes are being prepared on the table and is put back up on the ceiling afterwards.Fondue is a unique restaurant that offers a different experience. Above each table there is a telescopic hood that goes down to the cooking level while the dishes are being prepared on the table and is put back up on the ceiling afterwards.